Google Maps Terrain Downloader can automatically download Google Maps small terrain tile map images and then combine them into one big map image. Google Maps Terrain Downloader supports multithreads, the download speed is very fast. And it is very easy to use. All downloaded small images are saved on the disk. You can combine them after downloading or later. Isn't it very cool that you make your hometown's high precision terrain map by yourself. ...... You can combine them after downloading or later. Isn't it very cool that you make your hometown's high precision terrain map by yourself. How to view downloaded terrain map images? You can view downloaded terrain map without combining them into one big BMP. We provide a tool : You can run it from menu "Tools"->"Terrain Map Viewer". Then open a project from menu "File"->"Open project..." to view the map. After downloading, all small images are saved on your disk. Then you can combine them into one big image map. We provide a tool : You can run it from menu "Tools"->"Combine images... ". The output big image is in BMP format. You can convert it to other format by yourself using some image tools such like PhotoShop. Qweas is providing links to Google Maps Terrain Downloader 6.49 as a courtesy, and makes no representations regarding Google Maps Terrain Downloader or any other applications or any information related thereto. 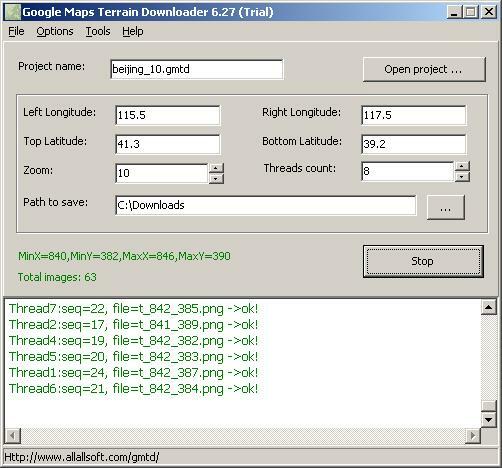 Any questions, complaints or claims regarding this application Google Maps Terrain Downloader 6.49 must be directed to the appropriate software vendor. You may click the publisher link of Google Maps Terrain Downloader on the top of this page to get more details about the vendor.